So you are planning the refurbishment of your business and are looking for some new table tops to brighten up your commercial interior. With such a wide variety of table tops available for commercial use in the UK, it can be quite a daunting task to find the right tops for your business. For this reason we have decided to write a post to help you understand the pro’s and con’s of each type to help you decide which table tops will be most suitable for your bar, restaurant, pub or café. 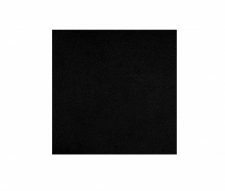 We have listed each type of table top below with a description detailing all you need to know and how suitable they are for each type of commercial interior. Many years ago laminate table tops were considered to be an inferior product when compared to their solid wooden counterparts. This was because in the early stages of this materials development, there were not many laminate decors available and the ones that you could buy used to crack or bubble and a new table top would look very used and worn fairly quickly. Decades have gone by since this was the case and with much improved manufacturing techniques laminate table tops not only look the part these days, but now there longevity far exceeds that of a solid wooden table top in the same commercial environment. Modern laminate tables are very hard wearing, resilient to scratching and heat resistant to 180° F which makes them perfect for commercial use where food is being served such as cafes, pubs and restaurants. They are also very easy to clean and easy to maintain. The industry standard thickness for a laminate top is 25mm or 1” however 40mm and 50mm thicknesses are not uncommon and can be manufactured for bespoke orders. The thicker tops usually have a BDE (Built Down Edge) instead of being the same thickness all the way through. This not only keeps the cost down but it also has the benefit of concealing the table base attachment when looking at the table from the side. 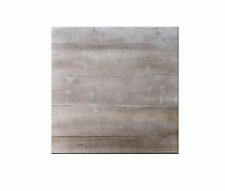 The core material of a laminate table top is MDF (Medium Density Fibreboard) that has one of many laminate decors bonded to the top side and a balancing laminate (usually white or grey) bonded to the underside. The purpose of the balancing laminate is to keep the top flat and prevent it from bowing. Some manufacturers self-edge the table tops (use the same material on the edges as the top) this has its drawbacks because self-edges are prone to chipping and peeling. Warner Contracts only use matching ABS (Acrylonitrile Butadiene Styrene) edges, which look like the same material as the top but are actually made from a shock absorbent plastic which prevents chipping and peeling. 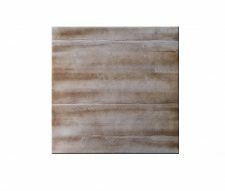 As a general rule laminate table tops tend to modernise an interior; however there are literally thousands of decors to choose from, some of which have a distressed appearance and textured finish which could potentially be used to maintain a traditional room setting. Our preferred laminate supplier is Egger due to their expansive range of quality laminate decors which suit a broad range of commercial interiors. Decors can also be sourced from a number of other companies such as Formica, Polyrey, Woodlam, Abet and Oberflex. Warner Contracts stock a good range of laminate table top sizes and shapes, we can also produce bespoke sizes when required. 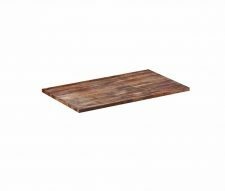 All of our table bases can be used to support laminate tops even if you have not purchased them from us. You don’t need to drill pilot holes to attach them, just use 1” self tapping screws and drive them in using a power drill. MFC (Melamine Faced Chipboard) has been broadly used in the production of commercial and domestic furniture for many years. It was first introduced in the 1950’s as a material to make kitchen work surfaces and cupboards out of. These days the use of MFC is even more widespread and now it is also used as a commercial table top material in the corporate, education, leisure and hospitality industries. The principle behind MFC is very similar to that of laminates, however the core material is chipboard rather than MDF, as this helps to reduce the cost. 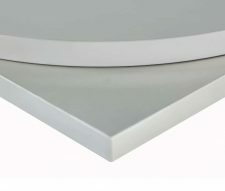 And instead of having a high pressure laminate bonded to the top a thin layer of melamine is applied which seals the surface and provides protection against wear and tear. The melamine is applied to the top and bottom of the table which means there is no need for a balancing laminate and both sides of the table top look the same. 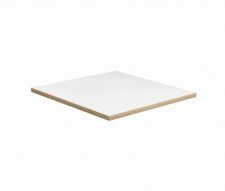 As with laminate table tops Warner Contracts only use ABS (Acrylonitrile Butadiene Styrene) edging as this helps to prevent chipping and peeling. We currently stock MFC Table Tops in four colours and in a variety of sizes with bespoke options also available. 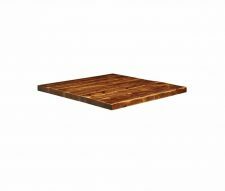 All of the MFC tops we supply are 25mm thick and can be used with any of our table bases. MFC Table Tops provide many of the same properties as laminates, they are easy to clean, hard wearing and heat resistant to 140° F.
One of the most traditional materials used to manufacture table tops is solid hardwood. It’s virtually impossible to replicate the warmth and character of this natural material with any man made substance, further to this each top has its individual wood grain and therefore is 100% unique. Hardwood Tops are a perfect way to maintain a traditional commercial interior such as in a country pub or restaurant. Although not quite as durable as laminates, when finished with an AC (Acid Catalyst) lacquer Hardwood Tops will withstand everyday use in commercial environments such as pubs and restaurants. They are also relatively easy to clean however certain industrial cleaning agents need to be avoided so the lacquer is not discoloured. 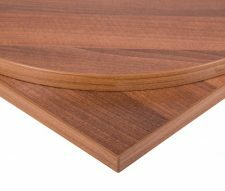 Warner Contracts stock a variety of 25mm thick solid wooden tops in Walnut, Oak, Wenge and Natural Wood Stains. Due to the woodgrain it is important to drill pilot holes before screwing the table base into the top, if holes are not drilled you run the risk of splitting the top. Due to the costs involved in manufacturing these tops, they are considered somewhat of a premium product and as such are towards the top of the price range. 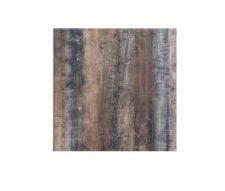 If you like the look of solid hardwood tops but find that they are outside of your price range then one possibility might be Ash Veneer Table Tops. 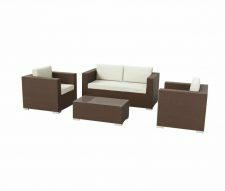 These are manufactured with an MDF core and a very thin layer of real wood veneer bonded to the surface. The tops are then stained and lacquered in the same contract standard AC (Acid Catalyst) lacquer as real hardwood tops are. Ash Veneer Tops are 25mm thick and the MDF edges are stained to match the top. One of the main drawbacks of these tops is that you can see the MDF on the edges, this isn’t so much of a problem on the darker walnut tables but it is clearly visible on the lighter natural colour tables. In theory due to the hard wearing lacquer that is used in the finishing process ash veneer tables are equally as hard wearing as the solid hardwood tops. That said over time when the finish has deteriorated solid tops can be sanded down back to raw wood, re-stained and re-lacquered to bring them back to new again. This process cannot be carried out on ash veneer table tops because they only have a thin layer of real wood on the surface. Any of our contract table bases can be used to support ash veneer table tops, you do not need to drill pilot holes. You can attach the base using 1” self-tapping wood screws once the top has been aligned the right place. These tops are ideal for indoor use in cafes, canteens, eaterys and some hotels and because of their low cost they can be afforded by many businesses. 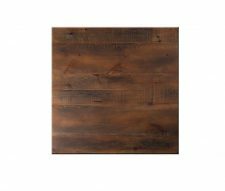 Their appearance is similar to solid hardwood tops and therefore can be used in both traditional and contemporary commercial interiors. If you like the look of laminate table tops but want to use them outside then Werzalit Table Tops might be the way to go. These are manufactured from a resin composite material that is moulded into various shapes and sizes. One advantage of this kind of table top is that there is no cutting involved in the manufacturing process, each top is moulded as one piece and therefore there are no edges that will let water in or peel. 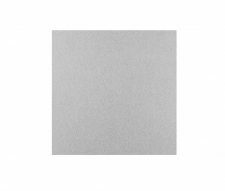 Werzalit Table Tops are available from UK stock in a wide range of colours, with an even broader array of options available to order with a relatively short lead time (usually 2 – 3 weeks). 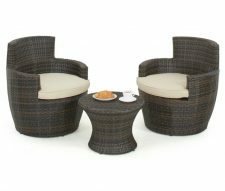 They are manufactured in Germany and have been on the UK commercial furniture market for many years. Similar to laminate table tops, Werzalit tops are heat and scratch resistant but they are also weatherproof and UV resistant. One drawback of these tops is that they are not designed for joining 2 or more tops together (to make a larger table when required), this is because they have a bevel edge instead of a straight edge. Werzalit Table Tops can be used indoors or outdoors and are ideal for cafes, bars, restaurants, break out areas and canteens amongst other uses. There are other companies that manufacture similar resin composite tops such as SM France and Topalit, Warner Contracts can also source from them so please feel free to get in touch if you would like a quotation. 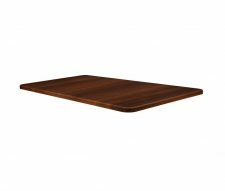 Teak is a beautiful hardwood that grows in the tropics, it has been used as a material to manufacture table tops and other furniture for many years. Teak is a oil rich wood which means that it is naturally weather resistant, making it a perfect material for outdoor furniture production. It is however advisable to oil teak furniture quarterly to help maintain the rich colour of the wood and to prevent it from cracking. This is especially applicable if the furniture is exposed to direct sunlight. Due to environmental concerns regarding the sustainability of teak hardwood it is important to only buy FSC rated teak products, such as the ones listed on our website. It is also worth considering some other more sustainable alternatives such as acacia and robinia wood to take the pressure off global teak farming. These alternatives are often cheaper and share the vast majority of the properties found in teak and aesthetically they are also very similar. 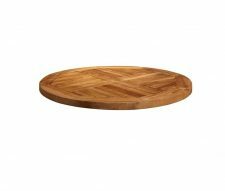 Warner Contracts also stock these products too, please view our table top category. Often considered as the ultimate in quality, granite and marble table tops certainly portray a premium image. They will also last indefinitely in a busy commercial environment because they are practically impossible to damage through normal use. These tops are manufactured with a layer of plywood bonded to the underside to allow pretty much any table base we supply to be screwed into them. Stone table tops are extremely heavy and will require at least two people to move each table. This may be a concern if you constantly have to reposition your tables to accommodate different size groups of customers. 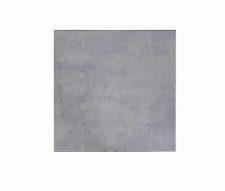 Price is also an important factor to consider as marble and granite table tops are right at the top of the price range. That said once you purchase these tops you should never have to replace them for maintenance purposes. Warner Contracts do not stock these products however we have supplied many businesses with them over the years, if you would like quotation please get in touch with sales.